We are a future-oriented, owner managed, forwarding and logistics company which has been operating successfully in this demanding market for over than 35 years. One of our key actities is the supply of up- and downstream logistic services to car manufactureres in Eastern Europe. Besides these featured aktivities, which are ensuring a constant growth in all branches, we are developing individually customized logistic solutions as well as designing and performing special transports worldwide for our international clients. 1992 Weskamp Hungary is founding member of EURASIA Sped Kft. 1993 Weskamp Hungary appointed as agent of TCU – TRANSCONTAINER UNIVERSAL (Bremen) in Hungary. Besides agency services, road haulage for containers in rail-road combined carriage to and from Hungary and Romania is provided. 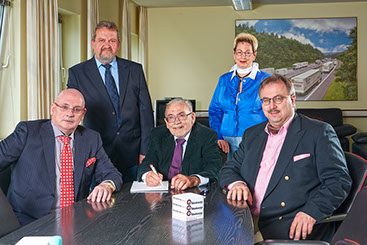 2001 Weskamp Transport establishes a Hungarian branch office at Telki, offering truck chartering services forfull- and part loads between Western Europe and Hungary, Slovakia and Romania and v.v.